Over the weekend, celebrities, fashion insiders, and music fans alike descended upon Indio, California, for the first weekend of Coachella. Naturally, our feeds were filled with sunset shots of the Ferris wheel, videos of Ariana Grande belting it out, and of course #ootds galore. Festival fashion has become its own subset of style altogether, with Coachella at the center of it all. No matter your thoughts on festival style, during these two weekends in April, there's no denying the plethora of free-spirited sartorial inspiration to be had. 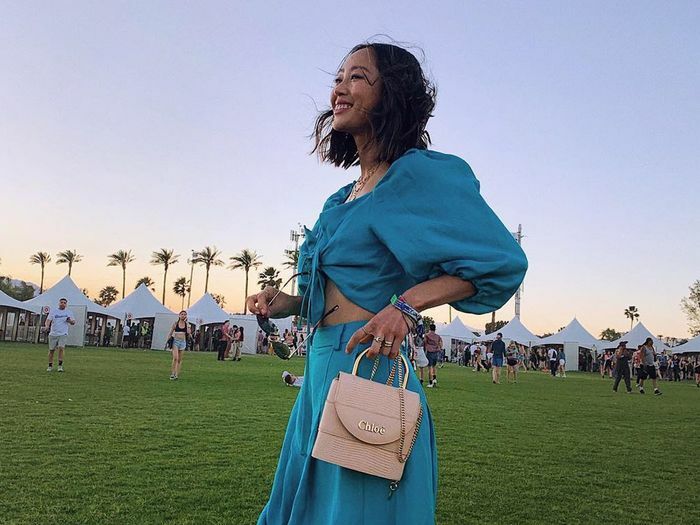 Which is why we're here to download you on the key Coachella handbag trends everyone wore to the 2019 festival. Great minds think alike, so they say, and the celebs on our radar all had the same thought because there were three bag trends we saw everyone carrying. Scroll down to see which trends they all favored and shop our picks of each style—for your next festival and beyond. Ah, belt bags. They're basically the official bag trend of music festivals everywhere, and this year's Coachella saw its fair share of them, from simple and minimal styles to designer logos. Structured handbags are on the rise for spring and summer, so it makes sense why we'd see the most stylish set of festivalgoer's opting for miniature-sized top handle bags to just throw in the essentials. Crossbody bags simply never fail, especially when running from stage to stage and dancing all night long—they're a no brainer. Next, the denim trends that were all over the festival.